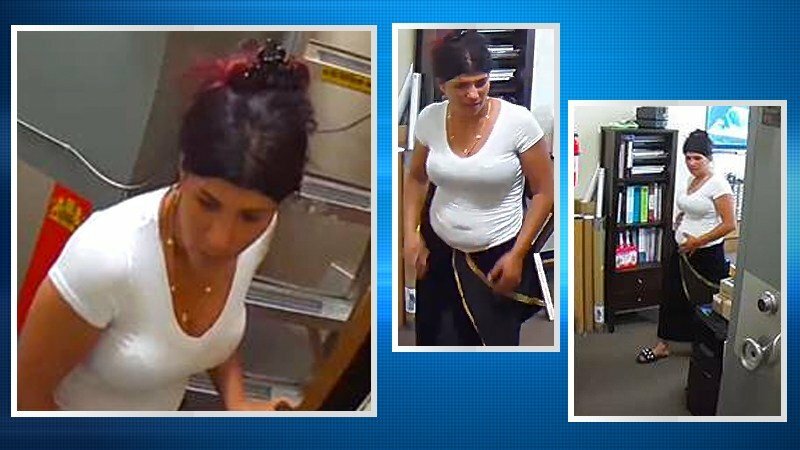 Escondido police sought public help Wednesday to identify a woman suspected of stealing from two jewelry stores this week while as many as 10 accomplices distracted store employees. ESCONDIDO (CNS) - Escondido police sought public help Wednesday to identify a woman suspected of stealing from two jewelry stores this week while as many as 10 accomplices distracted store employees. The most recent thefts happened Monday, but Escondido police believe the "organized, sophisticated and ... structured" group has pulled off similar heists throughout the region, making off with thousands of dollars in cash and jewelry. On Monday, Escondido officers responded to two burglary reports at jewelry stores in the city, Lt. Ed Varso said. Police did not disclose the names or locations of the stores, or what was taken, but in both cases, as many as 10 co-conspirators allegedly entered the store and worked to distract employees. "Once the employees are distracted, a female suspect sneaks into the rear of the business, searching for loose gold and jewelry," the lieutenant said. "These groups are organized, sophisticated and operate in a structured behavior to further their criminal behavior."